passed away in her sleep Wednesday night. she's perfect for this pint sized pup! 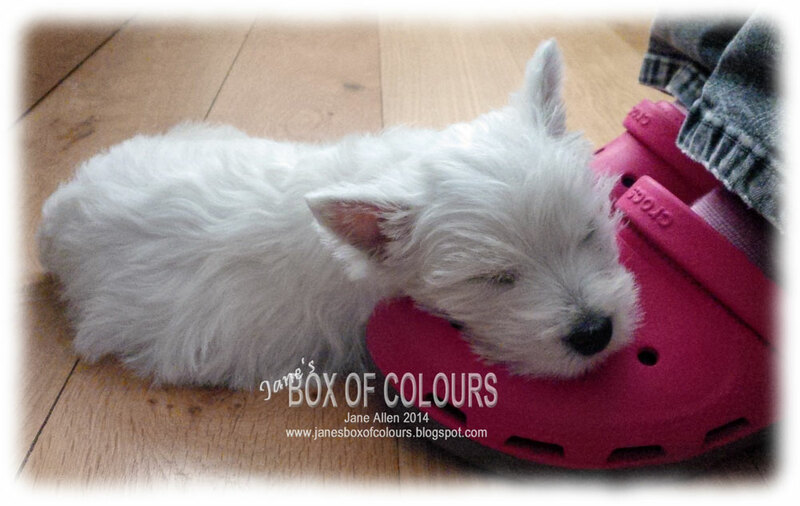 time for a nap on Mum's crocs! And the funny stripy toy we lovingly call Zonkey belonged to Roo, so although she did not get to meet her, Pip gets to play with her teddy. last night I got 4 hours sleep!! oh and she fits through the bars on the stair gate.......help! but for this week at least I'm concentrating on our little pup! So sad....followed by so sweet. So sorry to hear of Roo's passing, but wish you many happy years ahead with Pip. Sorry to hear you lost Roo Jane, its awful, like a member of the family but your new arrival should keep you busy, too busy to dwell on it by the sounds of things - Good luck, you might need it! So sorry for your loss Jane. Its very sad when you loose a dear pet and family member. The new puppy looks a little treasure. Hope you get some sleep soon. We have a TV show called "TOO CUTE" here in the States. Your little one would fit in with no problem. Too Cute. Just makes you want get all huggy. Oh Jane, so sorry to hear about your loss, my heart goes out to you. 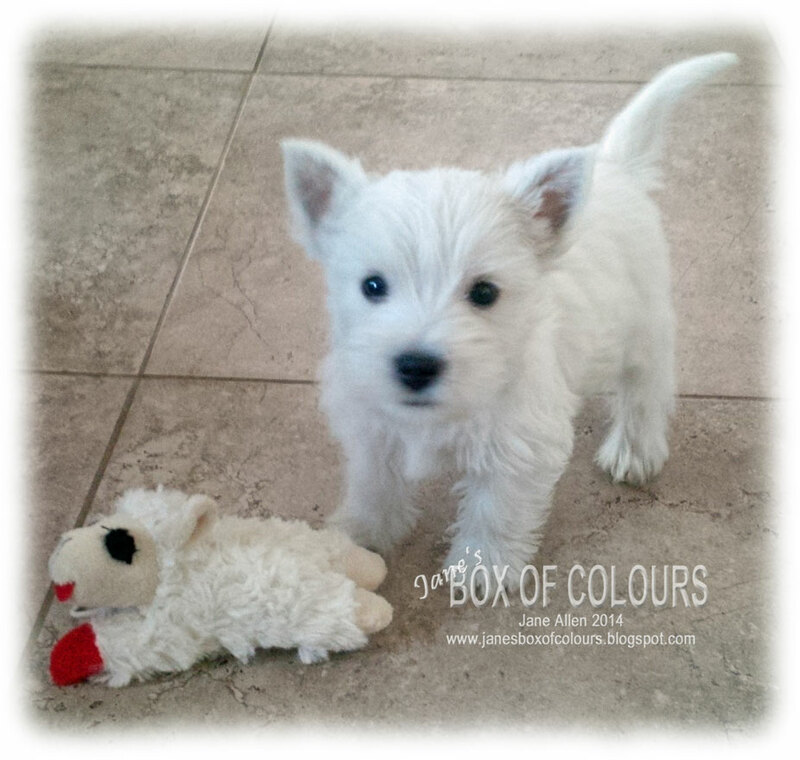 Awwwww Pip looks totally adorable, I must show my daughter later as she LOVES Westies. It sounds like you have your hands full, hopefully it will get easier soon and you will be able to catch up on some sleep. Jane, I'm so sorry to hear about Roo. Pip looks adorable and sooo cute. Hope you get some sleep! So sorry to hear about your Roo, it's so hard to loose our little furbabies. 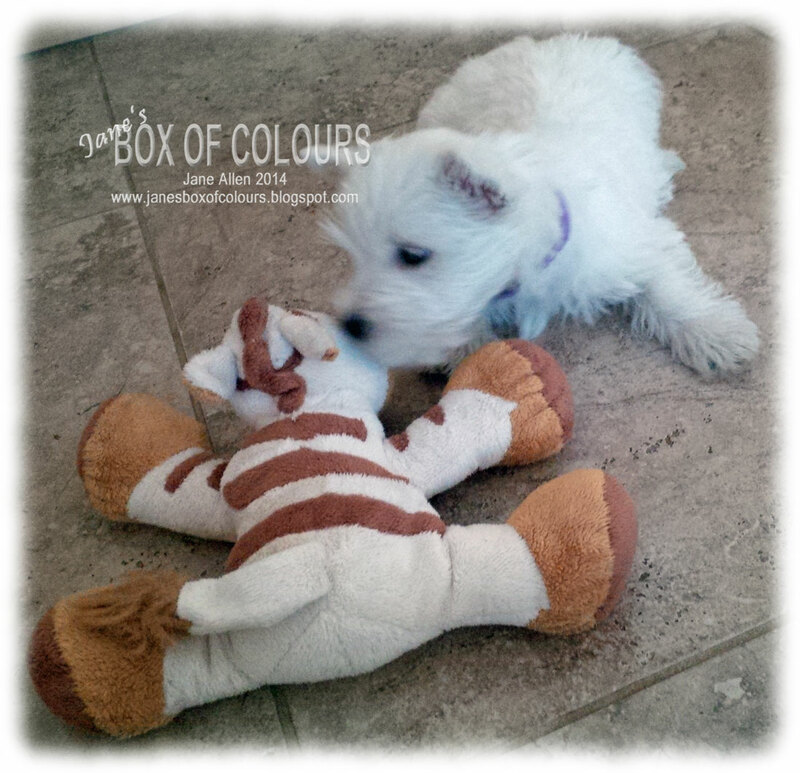 Love your new little pup - so adorable. So sorry to hear about Roo, Jane. Jane, Pip is just gorgeous! What a beautiful puppy. Our Maggie is 8 months now and such a joy, most of the time. Tenacity plus with our girl. I'll bet your Roo is having more influence on Pip than you realize. Super big hugs for you all and Pip! So sorry to hear about Roo. I'm sure having your little Pip will help you heal. Just be sure to teach your new sweetie that color pencils are NOT chew sticks!! 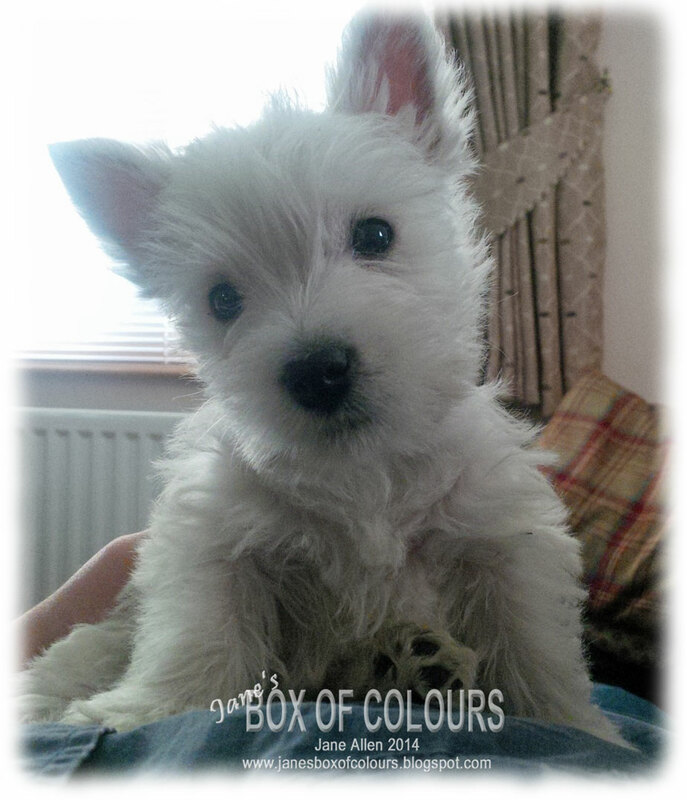 Welcome Pip... She is adorable. It's lovely having a new puppy around, they a so much fun (and work). She is just so sweet, Jane. Love the photos, especially of her napping with her head on your foot. Delightful. 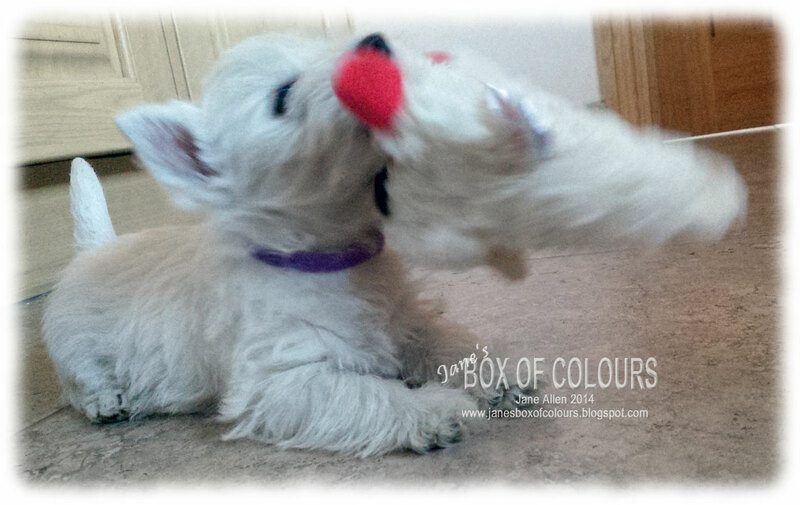 Pip is just adorable, My sister has a Westie and she would just fall in love with pip too. any more puppy photos ? Your brand new puppy is tooo sweet, I'd also love to have one like her too!